Ideal for light plowing, hilling, furrowing and cultivating. Versatile. Handles and framing constructed of heavy-duty powder coated tubular steel for long life. 24'' steel wheel makes operating through the soil effortlessly and quickly. 3 position adjustable height handle and tool bar depth makes it a easy fit to individual needs. Hours of comfortable use. Easy change tool bar for quick tool installation. Comes with furrow and moldboard plow blades. 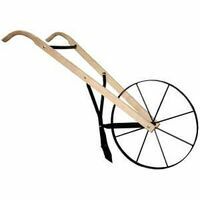 Perfect for smaller gardens, this human powered cultivator will furrow, weed and plow your tilled soils. It's been around for generations because it's easy to push and maneuver. The 4-1/2" handles provide excellent leverage and maneuverability. Minimal maintenance. Includes turn shovel, 5-tine cultivator and double point blade. Dimensions: 60"L x 24"W x 38"H. Steel wheel measures 24" diameter. Wood handle measures 4.5' length.